Please contact us if your church, organization or group is interested in using our electronic sign for advertising. All of our licensed directors adhere to the highest standard of ethical practices and are committed to ensuring that all of your needs are attended to. Their commitment to the community and genuine compassion toward families are but a few of the characteristics that make them outstanding in their field. We are proud to have them on our staff. Born and raised in Stevens Point, Dean has been serving the community since 1985 as a licensed funeral director. A 1981 graduate of SPASH, earned his B.A. at Lakeland College. Dean is a 1985 graduate of Milwaukee School of Mortuary Science. He has been active with many organizations including, Kiwanis, Stevens Point Youth Baseball, Plover Lions, St. Bronislava Grief Ministry, American Legion Baseball, UW-Stevens Point Softball, Knights of Columbus, SPCC, PABA, and St Michael's Hospital Foundation. Dean coached baseball and softball for 17 years. He was proud to serve as American Legion Baseball Head Coach for five years and his 1992 squad won the State Championship and the 1993 team finished in the top 16 in the nation. In 1998 he was the head coach of the UW-Stevens Point Women's softball team that won the Division III National Championship. He now enjoys golfing in the summer and spending time with his wife Lori, family, and friends. Born and raised in Sioux Falls, SD Jason moved to Stevens Point in July 2016. Jason graduated from Roosevelt High School in Sioux Falls in 2004. He then continued his education at South Dakota State University graduating with a Bachelor’s Degree in Psychology. Jason was actively involved at SDSU. He taught Biology 101 labs as an undergraduate and was also an undergraduate teaching assistant for the Anatomy program at SDSU. After taking a year off college, Jason decided he wanted to help serve families as a funeral director. Jason furthered his education at the University of Minnesota and obtained his Bachelor’s in Mortuary Science. During and following school, Jason was employed with Dakota Embalming and Transport Services in Sioux Falls, SD. There he was an embalming specialist and crematory operator until he joined the Shuda family in 2016. Jason enjoys being active. A couple of his favorite hobbies include power lifting and racing. Jason has competed in multiple powerlifting meets since 2008. Jason’s other passion is racing. This is what brought him to Stevens Point. During a race event in Brainerd, MN he met Kirsten Miller of Marshfield. She lives in Stevens Point and is a 1st grade teacher at Almond-Bancroft Elementary School. Jason is also a member of the Central Wisconsin Sports Car Club. This club puts on many autocross and track events in the area. They also travel nationwide to different tracks. The club races all year, during the winter you’ll see the club racing their cars on the ice of Lake Dubay. Jim and Marti Shuda opened Shuda Funeral Chapel in October of 1967. After graduating from Pacelli High School in 1958, Jim attended St. Norbert College in DePere where he studied engineering. During his sophomore year he signed a professional baseball contract with the Chicago White Sox. During his three years in the Sox organization Jim pitched against many future major league players including Pete Rose. After returning to his hometown, he earned his funeral director license in 1965. Among his board of director community involvement over the years include the YMCA, United Way, St Stanislaus Parish, Optimist Club, Little League, and Knights of Columbus. Marti a 1958 graduate of Rosholt High School was a homemaker, and very involved mother of seven children! Together they have 22 grandchildren and enjoy their time being with family and friends. Kent Miller has been a licensed funeral director for the past 30 years. He is married to Beth an elementary teacher. They have two sons. Nathan and Joel. 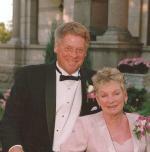 Kent was a owner/funeral director in Sparta, WI, before joining the Shuda Funeral Services.